Easy to make, pretty to look at, tasty to eat – this dish could be called triple happiness beans. I assume the “double” refers to the two types of bean involved – Chinese black beans and fresh green beans. These are not the same black beans that feature in Mexican recipes like sweet potato and black bean tacos, but soybeans that have been dried and fermented with salt. Pungent and intensely salty, Chinese black beans should be soaked before use to avoid overpowering the other ingredients. This recipe is adapted from Jill Dupleix’s Good Cooking, The New Essentials. In a small bowl, cover the black beans in cold water and soak for ten minutes. Drain and set aside. Bring a pot of salted water to a simmer. Add the green beans and red pepper and cook for three minutes. Drain, refresh with cold water then pat dry. Heat the sunflower oil in a wok over a medium high flame. Add the ginger, garlic and chilli and stir fry for a couple of minutes. 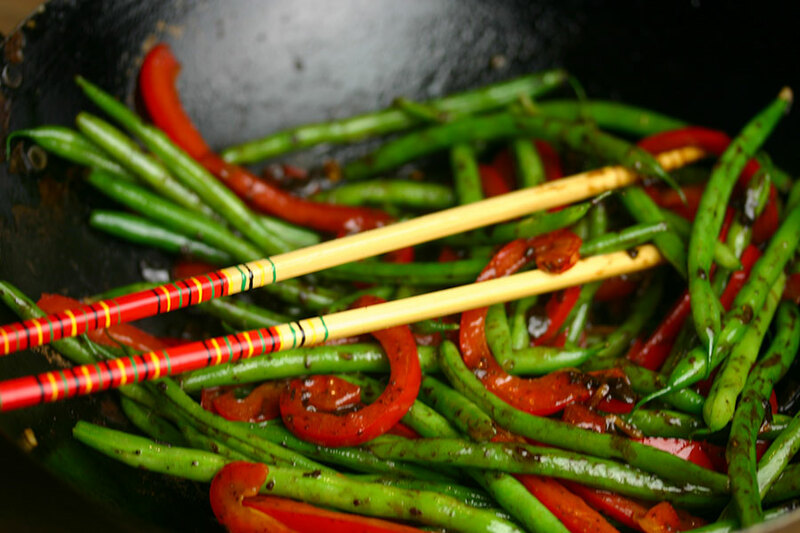 Add the green beans and red pepper, and stir fry a few minutes more. Now add the black beans, rice wine, soy sauce, and sesame oil and mix thoroughly. Pour over the cornstarch-water mixture and cook until the sauce thickens.